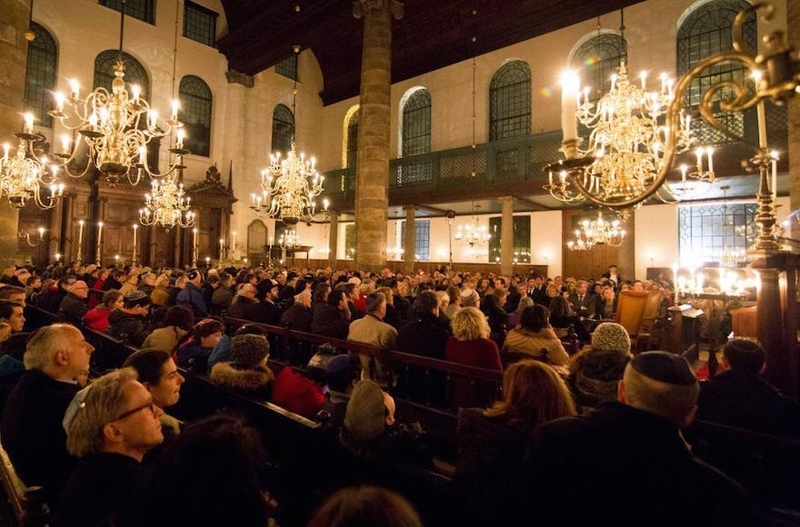 AMSTERDAM (JTA) — His name was never mentioned during the Netherlands’ main commemoration event for Kristallnacht, but Donald Trump was likely on everyone’s mind at the ceremony at the Dutch capital’s majestic Portuguese Synagogue. It wasn’t for any imagined parallels between Trump’s election as U.S. president and the campaign of violence that the Nazis unleashed 78 years ago against German and Austrian Jews, which many historians see as the opening shot of the Holocaust. Most European Jews, whose families still live in the shadow of that pogrom and the extermination it heralded, would find that comparison cheap and even hysterical. Trump was on my mind Wednesday evening because his election — the latest upset in a series of unforeseen shifts in global politics — begged comparison between his style and that of the European head of state in attendance: Dutch Prime Minister Mark Rutte. A young and dynamic leader, Rutte is well-liked for his chummy yet courteous behavior but heavily criticized for his pragmatism. Amid speculation that Trump’s election and Britain’s vote to leave the European Union herald a wider shift in European politics, I wondered if even successful Old Guard politicians such as Rutte could prevent a power vacuum that would embolden radicals with Kristallnacht-like ambitions. Rutte, a center-right politician whose coalition partner is Dutch Labor, touched in his speech on some of the themes witnessed during the U.S. presidential campaign, when Trump broke accepted speech norms by calling Mexicans rapists and proposing a ban on Muslims entering the country. By commemorating Kristallnacht, Rutte said, “we show we are vigilant here and now of anti-Semitism that always lies under the surface. Against discrimination and exclusion of ethnic groups. Against intolerance,” he added in the soft light of an overcast sunset. Following his address, which was announced at the last moment and unusual in that Dutch prime ministers rarely attend Kristallnacht commemorations, Rutte hugged a woman who survived the pogrom in the German city of Essen. The survivor, Mirjam Weizner-Smukn, in her remarks also reminded me of the charged populist atmosphere surrounding the Trump campaign and Great Britain’s Brexit vote. Rutte’s warm embrace of Weizner-Smukn and the Jewish community — wearing a kippah and with a single security guard in tow, he mingled with the synagogue crowd like a regular, shaking hands and chatting — was typical of his rapport, which has made this right-leaning leader acceptable even to hard-left voters and politicians. But his message of acceptance and respect, which has been the norm on a continent with memories of fascist cruelty, is giving way to new voices that are rising in popularity based on polarizing rhetoric, disdain for “elites” and a deep concern for, if not outright fear of, the other. In the Netherlands, the far-right politician Geert Wilders, who is on trial for promising to make sure his country has “fewer Moroccans,” is waging a withering assault on Rutte ahead of the general election in March. His tactics, centering on Rutte’s power sharing with Labour, seem to be working: Wilders’ Party for Freedom and Rutte’s People’s Party for Freedom and Democracy are seesawing in the polls to see which will be the largest faction. Wilders, who often speaks of his support for Israel and “Judeo-Christian values,” belongs to a loose alliance of anti-Muslim European nationalists riding a wave of discontent with the European Union, Muslim and Slavic immigration, and a culture of political correctness whose critics say comes at the expense of national cohesion, sovereignty and traditional values. He and his European allies have celebrated the election of Trump and Brexit – two upset events unforeseen by polling and widely thought of as protest votes against a discredited establishment. They see them both as historical turning points and harbingers of their own success in future elections. While that may be true, Europe’s far right was doing pretty well even before Trump’s stunning defeat of Hillary Clinton. Marine Le Pen of the National Front party in France is running ahead of the other candidates in the 2017 presidential elections with an unprecedented 26-29 percent projected for her anti-Islam party in most major polls. Her Austrian counterpart and ally, Norbert Hofer, is projected to win a popular vote next month after losing by a hair’s breadth to a liberal candidate in a May vote that was nullified over irregularities. Further east, hard-right movements like the Law and Justice Party in Poland and Fidesz in Hungary are locked in a bitter fight with even more extreme forces like Jobbik. They are competing over voters who are resentful of austerity measures dictated by richer EU members and their insistence, citing humanitarian principles, that Muslim migrants be allowed to cross into the bloc from the east. Still, Trump’s election clearly reinvigorated nationalists across Europe, drawing their elated praise from Bulgaria to Spain. Le Pen said that with Trump’s rise, the American people had been set “free.” Wilders called it a “revolution” that will repeat itself in the Netherlands. Golden Dawn, the Greek neo-Nazi party, posted online a video of its beaming spokesman speaking of “a major global change,” including in his homeland. Back in Holland, Naftaniel worries that this is more than empty bravado. But even Rutte will not be able to guarantee the survival of centrists in power, Naftaniel warned, unless he internalizes the “fundamental change in how politicians need to interact with voters” in the post-Trump age where social media memes and populist slogans seem to be replacing well-reasoned debates and speeches.